Solar power harnessing technologies are moving forward in various forms, and are expected to have a significant impact on the accessibility and affordability of electricity for everyone on the planet.In recent years, there has been rapid growth in research aimed at enhancing solar cell efficiency, and now there’s more renewed interest in the design and development of printed organic solar cells, thanks to the fact that they are solution processable.Australian Solar Quotes strongly believes in a bright future for polymer organic printed solar cells and has been using its expertise to report on and highlight more emerging clean technologies poised at ensuring the future of solar power includes affordable, non-toxic, highly accessible, safe, printed organic solar cells.In our ambitious goal to see clean energy provided to Australians and the whole world at large, we have extensively and continually researched and written about silicon-based vs polymer solar photovoltaic panels. We are relieved to know that it is not really a matter of one or the other, but simply r of having all-in clean technologies to stem the seemingly unforgiving climate change.Printed organic solar cells are definitely a huge contributor and all those more exotic green technologies still in the pipeline may also contribute. And yes! That’s a big thing!Indeed, printed solar cell technology is a renewable game changer that carries the promise of providing the ultimate solution to our energy needs - the technology is light-weight, cheap and easy to manufacture. A team of five researchers from the University of Newcastle impressively installed the first commercial printed solar cells on a factory roof.The 200-square metre array solar system features specialised semi-conducting inks that have been printed on a reel-to-reel (R2R) printer.Advocates of printed solar panels say the revolutionary technology could transform the way solar systems are manufactured and distributed around the globe; something that might just render renewable power a much more affordable option.The working solar panels were installed in a record one day by the research team. Notably, none of the existing clean energy solutions is as lightweight, quick to produce and easy to mount on such a scale.Apparently, the research team used standard printing methods to manufacture the solar modules. Typically, they use the machine used to print wine labels.Each of the solar cells in the array has several single layers printed atop each other and then joined in series to make a set of cells. These cells are eventually joined in a parallel form to create a solar module. 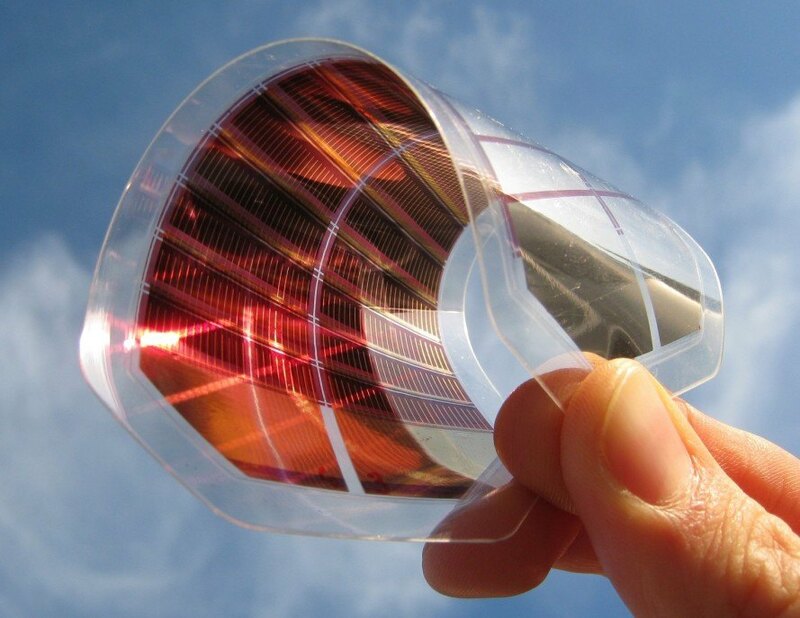 How are the Solar Cells Printed? Despite being less efficient than the traditional silicon-based solar panel, developing them isn’t quite as simple as clicking the print option on your computer.As a matter of fact, printing solar cells isn’t a new concept. Various research teams around the globe including Monash University and the CSIRO have been developing the technology for almost two decades. The latest installation by the University of Newcastle puts the institution ahead of the game.The new technology, which is set to undergo a six-month testing phase on the CHEP company factory’s roof, is expected to be launched onto the commercial market in about two years.The University began working on the concept in 1996 and progressed from producing just tiny, millimetre-sized organic solar cells to its first commercial installation in Australia.Their newest installation features ten metre-sized modules inserted between two contact coatings of recyclable plastic.Set at the core of this technology are flexible, semi-conducting polymer-based inks invented by the University.This combination of materials has essentially altered how electronic devices are built and creatively replaced the tough, rigid and glass-like materials like silicon with specialised paints and inks that can be used to print or coat over a vast area at very low cost.Thus, these modules are cheaper, going as low as $10 or less per square metre when mass produced.In other words, it would take just 2-3 years for this new technology to become cost-competitive with the rest of the clean technologies, despite being at 2-3% efficiency.The final product of printed solar units can then be mounted onto any roof or surface with an adhesive tape and using press-studs affixed to wires.The University says it doesn’t want to rush things. This is a good thing given that in the past many great ideas have been smothered by pushy and greedy investors before even taking off the ground.Instead, the institution plans to establish a strong foundation for a solid, clean technology, and thereafter scale up to greater heights. The latest innovation and installation at Newcastle marks a great milestone towards commercialisation of the groundbreaking technology. The six months trial period will be used to test the technology’s performance and durability levels before the materials are removed and recycled.So, does the technology deserve that much hype? Well, we think it has tremendous potential despite being in the trial phase. And it’s a step closer to achieving the objective of having roofs, windows and walls in every city and country installed with printed solar cells to ensure affordable, sustainable electricity for everyone.In the long run, the new solar cells are poised to provide power to even those people without space on their roofs.For instance, those who reside in apartment complexes could sign up to a given plan that allows them to pay for electricity produced by solar cells integrated within the infrastructure without necessarily having to own it.Remarkably, given the vague and highly fractured energy policy space, this latest technology is a clear indication of the importance of consumers taking energy matters into their own hands. Printed organic solar panels are less efficient when compared to the silicon-based panels.The new solar cells are polymer-based, hence non-toxic in that at the end of their useful lifespan, they can be burned or destroyed without producing toxic by-products.Minute elements of silver can also be recycled almost completely. This demonstrates the potential of this new technology perfectly.Even though the new solar cells do not have high efficiencies or long lifetimes, the researchers say they will continually work on these challenges as they scale the innovative technology.Organic solar cells are mostly viewed and compared with crystalline silicon technology, which has been exceptionally successful. As it stands, the latest solar cells cannot give the price of installed silicon capacity a run for its money.However, we must keep in mind that the greatest potential lies in the solar cell’s flexibility, thin outline, scalability and free-form design. This wide scope is important in pushing the technology into becoming more mainstream - and it is possible, we believe.Our dream here at Australian Solar Quotes is that the various stakeholders in the Australian energy sector will join forces and together make the industry strong. 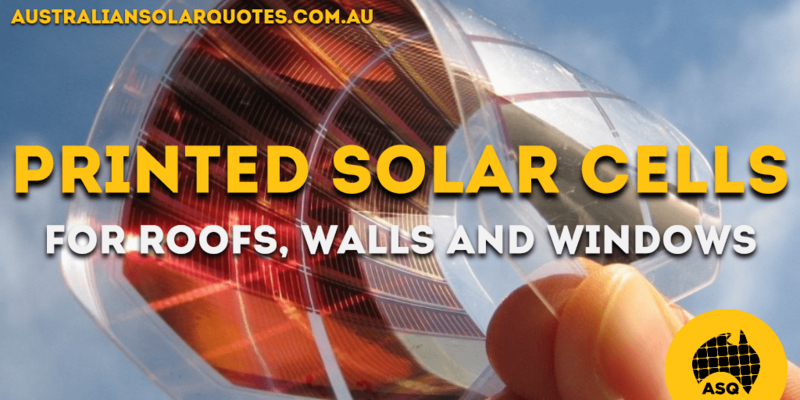 Printed solar is the future, and it will be huge.I wrote this article and published it first on Australian Solar Quotes. 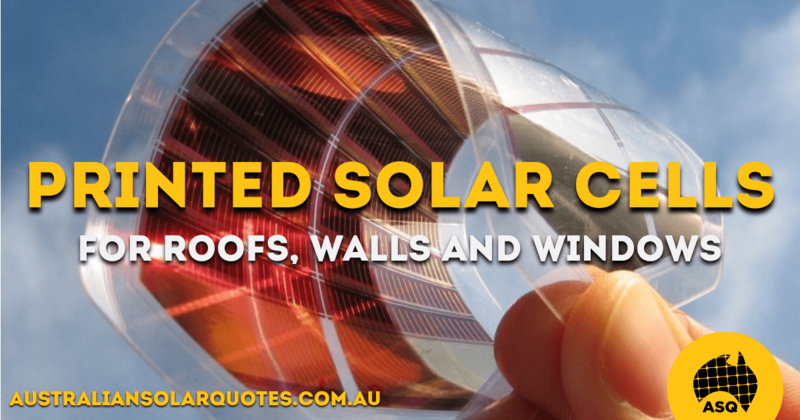 No Replies to "Printed Solar Cells To Stick On Your Roof, Wall And Windows"